The high country has had some spotty showers as of press time, but thunder showers could materialize. Let's hope they see lots of rain and not much lightning. Keep in mind that although the Apache-Sitgreaves National Forest instituted some additional closures along the Mogollon Rim (see news release below), both Woods Canyon and Willow Springs Lakes remain open, and the fishing has been pretty decent. By the way, Silver Creek has been receiving lots and lots of Apache trout stockings. The fishing there just has to be fantastic. Give it a try, especially at first light. Go past the Show Low Airport to Borden Ranch Road, head north, and go to Hatchery Way. Easy to find, fun to fish, and a great fishing acquaintance to make for the future (it is open and fishable all winter). Also, I chatted with the Coconino National Forest Mogollon Rim office on Wednesday and there are currently no plans to close Knoll Lake, Blue Ridge Reservoir (CC Cragin) or Long Lake. Another great one to try right now is Kinnickinick Lake, which is spring fed. I call it "old reliable," especially in summer. Just head toward Mormon Lake on Lake Mary Road and watch the signs. Upper Lake Mary is also worth a try for northern pike, walleye, catfish and yellow perch. This is also a good time to try for largemouth bass. Remember, there are no boat motor restrictions on Upper Lake Mary, so you can launch your bass boat and use the big engine. Heck, they even water ski there (no, that's not really trolling). T-storms in the high country are always possible. Keep in mind that as low pressure moves into the area, trout and other sport fish will become more active. 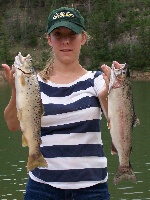 Show Low Lake, Fool Hollow Lake and Scotts Reservoir have all received lots of extra trout that we couldn't stock in other waters because of forest closures due to fires. Don't forget these lakes also have bass and catfish. Fool Hollow and Show Low lakes also have delectable walleye. Other great lakes to try right now are Dogtown, Whitehorse and Kaibab lakes near Williams. After the morning bite is over, try the old western movie set at the Grand Canyon Railway Depot for the daily shoot out. It's a hoot. Then maybe get your kicks along old Route 66. Farther afield, Becker Lake in Springerville is open. Folks, this is a trophy trout lake and when the barometer starts dropping, you might tie into one of those big trout you'll be daydreaming about for the rest of the summer. 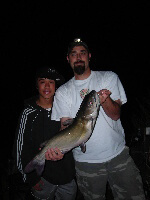 Whenever there is a new moon, it is a superb time to fish at night using submersible lights. 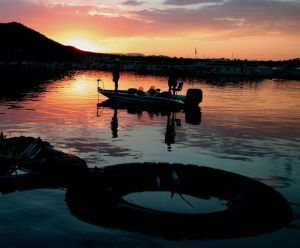 My top pick is Lake Pleasant for stripers using anchovies. Fish at night using little or no weight. Cut your bait into thirds, but cut your chum into quarters. Chum liberally. Add corn for a little extra fish excitement (it will also attract sunfish, carp and catfish). The more fish activity you can generate, the better; it's like a dinner gong going off under water that attracts predatory fish. Another great pick right now is Lees Ferry for the beginning of the cicada bite. This is a world-class fishery � made to order for escaping the crowds yet having an extremely high-quality fishing expedition. Just a side note, I will be on vacation until mid-July(attending the outdoor writers conference in Salt Lake City). Jim Harken (the voice of Game and Fish on our TV show) will be doing the fishing report. I am sure you will enjoy Jim's tips while I am gone. Hopefully, I'll bring you back some information from the ICAST Show (sport-fishing trade show) in Las Vegas at the tail end of my vacation, so it won't be all play for me (there is some work-play as well). Go catch some great memories while I am gone. Pray for rain, but in moderate amounts to avoid flooding in the burn areas.